As much as I loved Palermo, I have to say it paled in comparison to the the five days I spent with the most incredible group of bloggers at the Anna Tasca Lanza Cooking School. 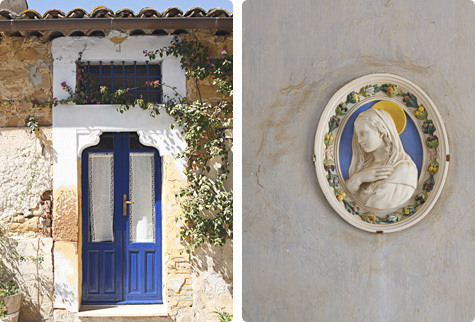 If the name Anna Tasca Lanza rings a bell for you, there’s a good reason. In her day, she was the authority on Sicilian food—the Marcella Hazan of the south. 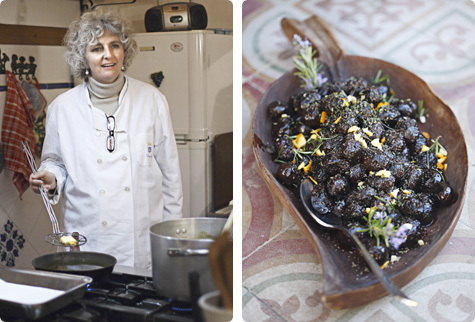 Back in the late 80s and early 90s, before any kind of regional awareness had entered the Italian food lexicon in the US, she began writing about traditional Sicilian cooking for the American market. As people woke up to the bold, rustic flavors of the island, her fame spread, and she began regularly collaborating with such food luminaries as James Beard, Julia Child* and Alice Waters, and making frequent appearances on television and radio. She published two books of her own, and among the other numerous Sicilian cookbooks on my shelf, I doubt there is one that doesn’t mention her name. 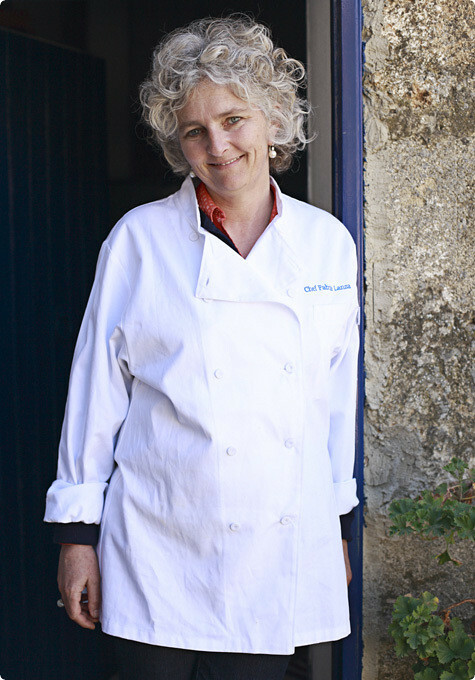 She also opened a cooking school on her family’s 19th-century estate, Regaleali. 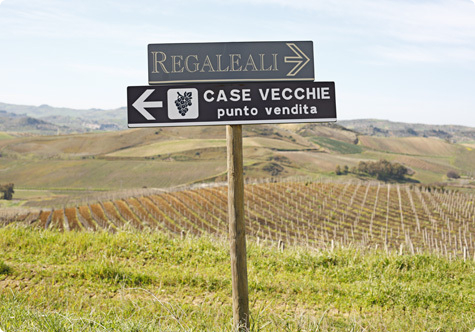 Located about halfway between Palermo and Agrigento in the mountainous Sicilian heartland, Regaleali has been in the Tasca family since 1830, when it was bought by Anna’s great-great-great grandfather, Count Lucio Tasca. 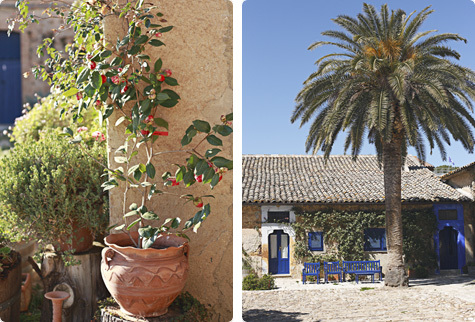 It’s still very much a working farm; wine, olive oil, wheat, almonds, favas and citrus are grown on its 1,200 acres of softly rolling hills, and even today it represents one of the major sources of employment for people in this impoverished corner of the island. 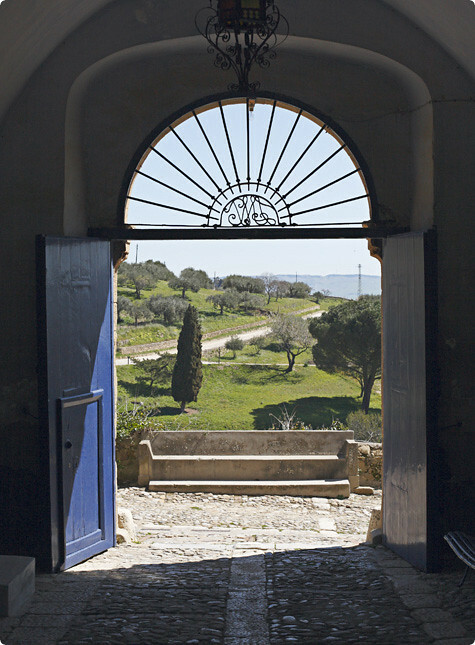 Over the years it has evolved, though, first with the establishment by Anna’s father of a state-of-the-art winery which now ranks among Sicily’s best, and later, when he divided up the estate among his children. 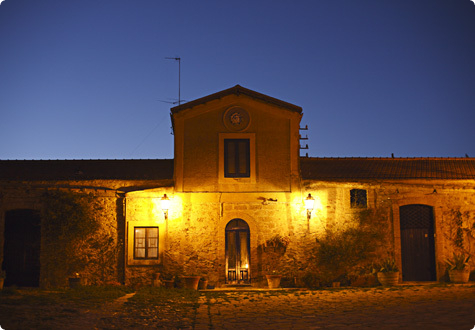 His son inherited the ‘main house’ and winery, and his three daughters were given smaller houses and land around the property; Anna’s was a traditional farmhouse set around a cobbled courtyard, called Case Vecchie. 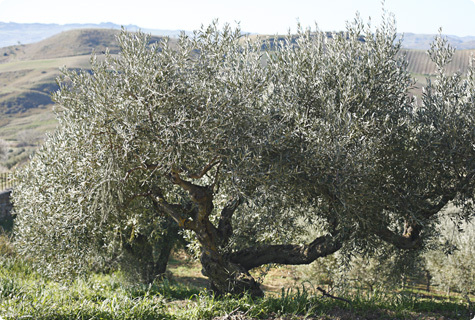 The estate is home to thousands of olive trees which produce a beautifully mellow, grassy oil the color of the afternoon sun. I think if I had an unlimited supply of oil like that, life would be pretty much complete. Anna and her husband had one daughter, Fabrizia. In her younger days Fabrizia was, by her own admission, interested in anything that wasn’t Sicilian, and as soon as she was old enough moved north, where she established a career as an art historian and had two children of her own. 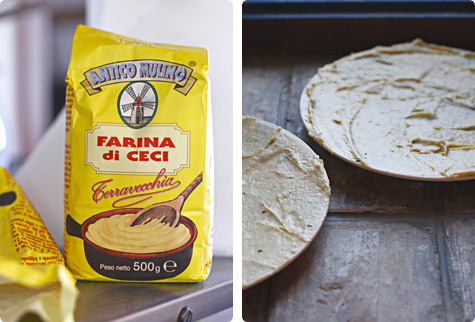 When Anna launched herself into the culinary world, Fabrizia cheered her mother on from afar, at first. 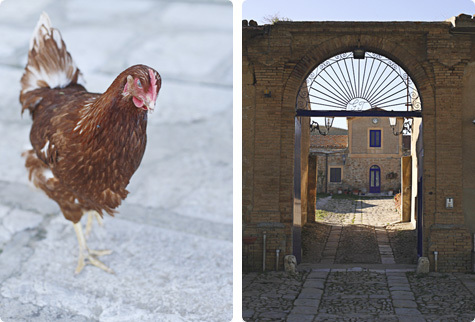 In her mid-40s, though, after suddenly finding herself out of a job, Fabrizia realized the not only was she deeply homesick for Sicily, but what she really wanted to do was dedicate her life to keeping traditional Sicilian cuisine alive too. 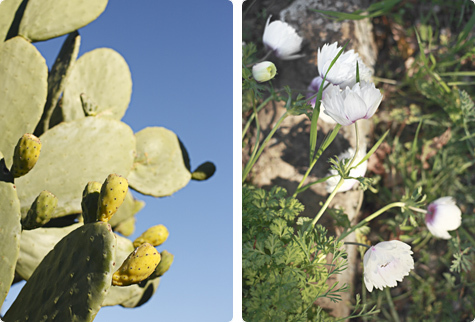 Cactus (aka prickly) pears grow everywhere in Sicily. They’re called fichi d’India (Indian figs), and put into everything from jam to ice cream. So Fabrizia moved back home and started working with Anna. Although she had previously never felt any particular affinity for cooking (“my affinity was for eating!” she told me), something about this food-centric life just felt right, like it was what she was really meant to be doing all along. It was only natural, then, that when Anna passed away two years ago, Fabrizia took over. She’s now an active ambassador for Sicilian cuisine in her own right, spending several months each year traveling, giving lectures and demonstrations, and cooking as a guest chef in well-known restaurants (she has regular gigs at Babbo and Chez Panisse, for instance). The rest of the year she spends at Regaleali, teaching cooking classes and tending to the estate and its endless harvests. And this year at least, entertaining food bloggers. Fabrizia with her cousin Giuseppe, co-owner of the estate’s winery Tasca d’Almerita along with his brother Alberto. Can you see the family resemblance? It’s all in the hair. 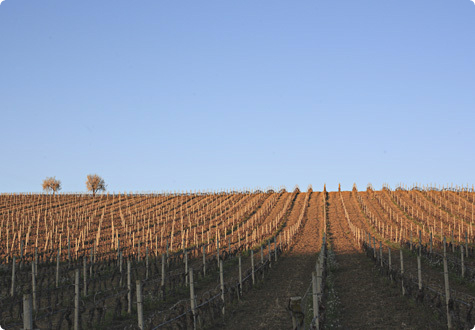 Due to the estate’s comparatively high elevation and clay-rich soil, the conditions are perfect for growing a variety of reds and whites. Although everything they grow is effectively organic, they reject labeling it as such. 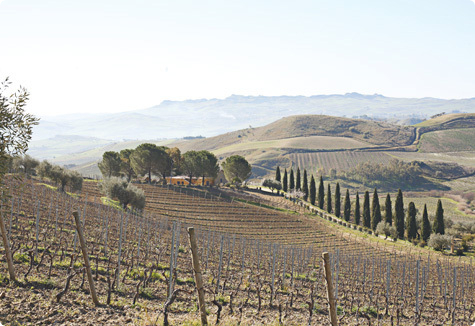 Guiseppe is actually very concerned about the environmental damage being caused by ‘organic’ wine production, in particular contamination caused by runoff of copper sulfate, which is used widely as a non-chemical fungicide. 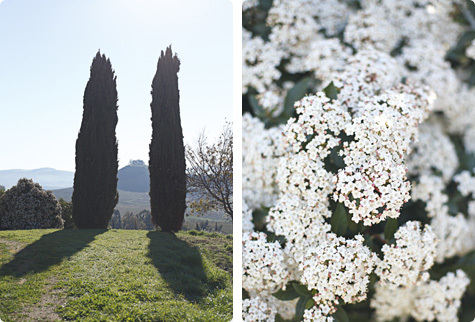 At Regaleali, by contrast, they take a biodynamic approach, and are constantly seeking new methods that allow them to grow as sustainably as possible. 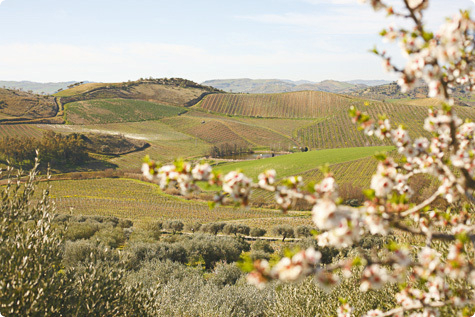 Regaleali in spring: flowering almond trees, olive trees, vineyards and endless blue skies. The thing that struck all of us, I mean apart from the sheer beauty of the place, was how we felt we were welcomed almost like members of the family. If you didn’t know they rank among Italy’s elite aristocratic families you certainly wouldn’t know it by meeting them; everyone we met was refreshingly humble and down-to-earth. Fabrizia, in particular—who, by the way, is also a marchesa (marquess) like her mother—took us under her wing with such warmth and affection that we felt more like long-lost children home for a visit than a crew of camera-toting journalists. Of course it didn’t hurt that we were all in our favorite element, in the kitchen and around the table. The daily program went something like this: wake up, stuff ourselves with sesame-crusted semolina bread, fresh sheep’s milk ricotta and about a dozen flavors of Fabrizia’s homemade preserves as well as a cake or two that had magically appeared overnight. Set off on a little outing to visit a local producer, accompanied of course by copious tastings. Around noon gather back in the teaching kitchen for a hands-on demonstration of whatever local specialties were on the lunchtime menu, followed by a four-course communal lunch. Digest for a couple of hours. At five gather back in the kitchen for an aperitif, a new lesson and, at the end, another three or four course meal. Stagger to bed swearing we will be much more successful at curtailing our gluttony tomorrow. Wake up, conveniently forget all about the previous night’s promises because really, food this good doesn’t just fall onto your plate every day, and repeat. 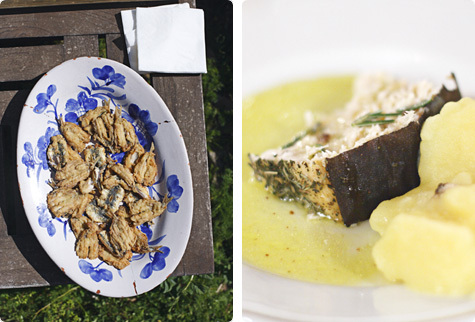 The iconic pasta con le sarde, pasta with fresh sardines and wild fennel. Now I understand why they say you can’t make it without that fennel—its flavor is like fennel on steroids. 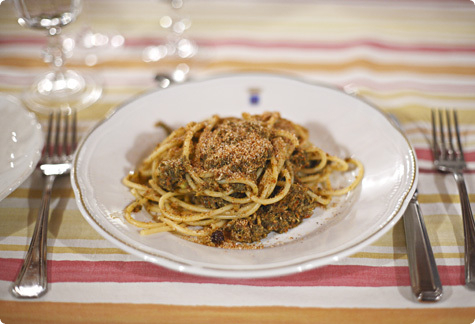 In this part of Sicily it’s traditional to top the dish with a mixture of toasted breadcrumbs and sugar. The sweetness is a bit jarring at first bite, but it quickly becomes addictive. How, indeed? I’m still trying to figure it out, actually, but at least I have memories, and more importantly, recipes. 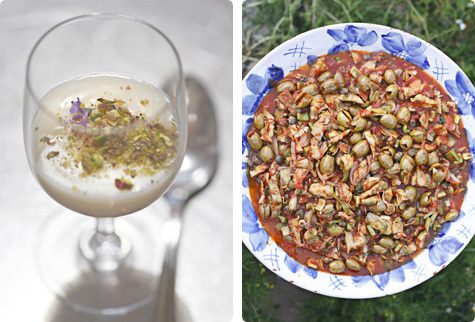 For things like a lemon-almond pudding called biancomangiare and sweet-sour artichoke caponata. For fried fresh sardines drizzled with vinegar, and swordfish studded with mint, garlic and rosemary before being gently baked in wine. 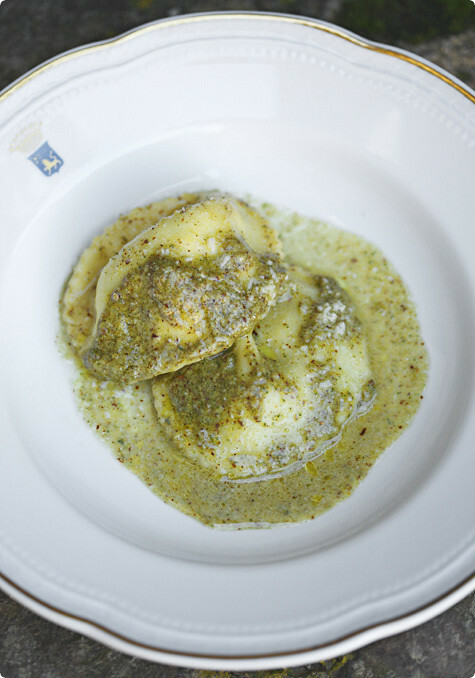 For pillows of pasta stuffed with mint-flecked ricotta and drizzled with sage-almond pesto. 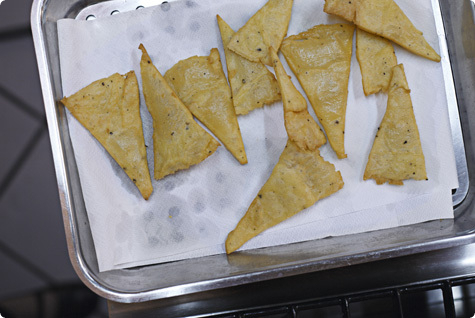 And for shatteringly crisp panelle, the secret to which is spreading the mixture as thinly as possible on plates, then letting them cool by an open window. It’s a good thing Fabrizia’s first book is coming out later this year. Otherwise I’d have to share all these recipes here, because really, they’re that good. Oh but don’t worry, of course I’ll give you one or two to tide you over in the meantime!